Tons of waste paper to be shipped to mainland China are piled up at a dock in Hong Kong, China, Sept. 15, 2017. China's decision last month to ban the import of certain types of waste and crack down on "foreign garbage" has had a ripple effect worldwide, forcing countries to quickly rethink their waste strategies. 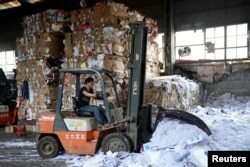 That includes China, where its own fight against recycled waste has only just begun, analysts say. 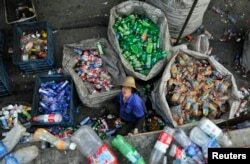 Prior to the ban, China was the final resting place for about half of the globe's metal, plastic and paper recyclables. But in an effort to protect the environment and public health, Chinese authorities have banned the import of 24 categories of solid waste, sending shock waves through the international waste processing industry. In the wake of the ban, most developed countries including Britain, the United States and Australia are grappling with a growing mountain of unprocessed rubbish and trying to find alternative destinations in Asia to fill China's enormous shoes. But Greenpeace East Asia plastic campaigner Eric Liu warned of the danger in their efforts to shift their trash headache to yet another developing country. FILE - A laborer looks up as she sorts plastic bottles at a garbage recycling center in Hefei, Anhui province, China, May 20, 2014. "This isn't really a feasible solution, very few places are equipped to handle the sheer volume of waste that was being processed in China. Ultimately, the foreign trash ban should act as a wake up call to the world. We seriously need to cut down on our production and consumption of plastic," Liu wrote in an emailed reply. Environmentalists like Liu are hoping the development will motivate countries to eliminate unnecessary waste such as single-use plastic products. Waste was one key topic Theresa May discussed when she met with Chinese leader Xi Jinping last week. Last month, the British prime minister pledged to eradicate all avoidable plastic waste in Britain by 2042 as part of a 25-year green strategy. Observers also note the ban is a positive step for China, although it has resulted in a shortage of some raw materials for the country's manufacturing sector. 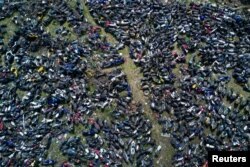 FILE - Wasted motorbikes are seen at a recycling center in Nanjing, Jiangsu province, China, March 27, 2017. Local environmentalists hope the ban will spur the country's waste processing industry to modernize and become more efficient. "The domestically-produced, consumed and disposed waste should be recycled locally," said Mao Da, researcher of solid waste treatment at Beijing Normal University. "Prior to the ban, part of those foreign recyclable rubbish was of better quality and in greater quantity. That led to the country's earlier dependence on foreign recyclable waste," he said, adding, "The potential of locally-disposed recyclables has long been overlooked." The researcher urges the environmental regulator to quickly enforce policies that will make households' recycling and sorting of solid waste mandatory. FILE - A laborer works at a paper products recycling station in Shanghai, China, Nov. 17, 2017. But Jason Wang, general secretary of the China Scrap Plastics Association said the country's waste has already been fully recycled. He said that the import ban is a natural move following China's rising awareness toward the environment and stricter standards for waste processing. "With or without the ban and before 2017, any waste in China that was recyclable and of economic values had been fully recycled," Wang said. "China has an enormous army of scavengers with much of its population still living around the poverty line. As a result of their contribution, the country's waste has long been fully recycled. So, the import ban is irrelevant to the country's recycling [efficiency] of local waste," he added. Feng Juan, research director of Incom Recycle Co., a Beijing-based recycler of used plastic bottles, disagreed. The company's earlier experience showed that many of the used plastic bottles in Beijing might have been left unrecycled as its affiliated factory used to have a hard time sourcing enough used bottles to fill its annual processing capacity of 50,000 tons. According to estimates, Beijing generates 150,000 tons in used plastic bottle waste each year, Feng said. Feng said the way local collectors had processed used bottles without a proper wastewater management in place further prompted the company in 2012 to facilitate a smarter way to source used bottles by bypassing those middlemen. The company has since installed 5,000 vending machines in Beijing that collected 55 million used bottles directly from consumers last year. "Through our platform, we can trace every single bottle we have collected and guarantee its safe [processing] flow," Feng said. "While in the past, no one could tell the exact flow of used bottles or where they've ended up," she added. China is also taking aggressive steps to tackle its plastic waste problem. According to Greenpeace's Liu, an estimated 1.3- 3.35 million tons of the plastic waste that's polluted the world's oceans come from Chinese cities. China's National Development and Reform commission is reported to have been mulling a new policy, specifically targeting plastic waste generated by the country's e-commerce, courier and food delivery sectors. Liu said that if that policy is enacted it would be another positive step for China to bring the country's rampant use of plastics under control. China has imposed decade-long restrictions on the use of plastics, but lack of teeth in its enforcement has meant little success for the country's past fight against plastic waste.